MARY FEDDEN OBE RA LG 1915-2012 ‍ Mary Fedden was one of Britain's finest and best loved contemporary artists. She was born on 14th August 1915 in Bristol and was married to the artist Julian Trevelyan. She studied at the Slade School of Fine Art, London from 1932 to 1936. She went on to teach Painting at the Royal College of Art from 1958 to 1964 where she was the first woman tutor to teach in the Painting School. Her pupils included David Hockney and Allen Jones. Fedden has exhibited in solo shows throughout the UK every year since 1947. Mary Fedden also received many mural commissions, notably the Festival of Britain (1951), the P & O Liner Canberra (1961), Charing Cross Hospital (1980) and Colindale Hospital in 1985. 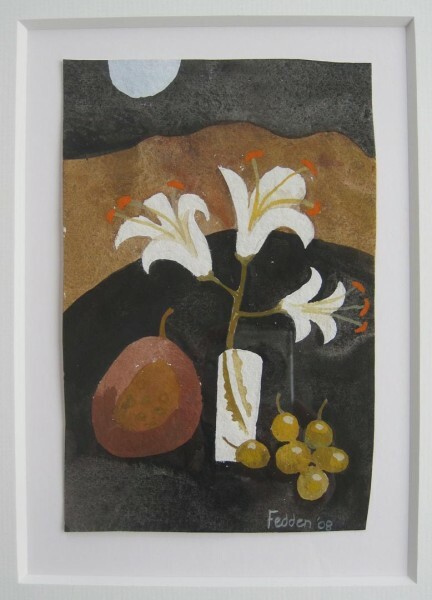 Mary Fedden was President of the Royal West of England Academy from 1984 to 1988 and was elected a Royal Academician in the Senior Order in 1992. She received an OBE and a Doctor of Literature, Bath University in the 1990s. Her work hangs in many private collections including HM The Queen for Windsor Castle, Prince Hassan of Jordan, the Tate Gallery, Bristol City Art Gallery and The Royal Academy. In 1997 she won the prestigious Mother Goose Award for Children's Book Illustrations. She married the artist, Julian Trevelyan in 1951, he died in 1988. Mary Fedden lived and worked in London, her subjects are executed in a bold, expressive style with vivid and contrasting colours.